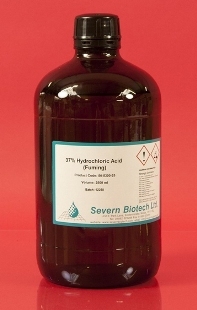 Hydrochloric acid (>36% w/v, fuming) is a clear, colourless, highly pungent solution of hydrogen chloride (HCl) in water. It is a highly corrosive, strong mineral acid with many industrial uses. 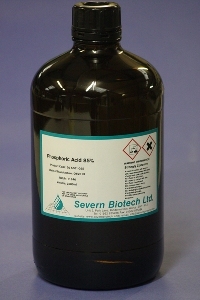 Hydrochloric acid is produced in solutions up to 38% HCl (concentrated grade). Higher concentrations up to just over 40% are chemically possible, but the evaporation rate is high. Industrial-grade is 30-34% w/v. Higher concentrations require the material to be pressurized and cooled to reduce evaporation losses. 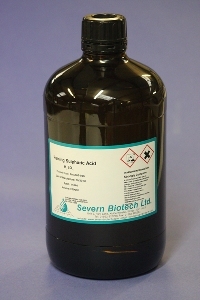 This product is used to adjust pH in laboratory buffer solutions and as a general laboratory reagent. HCL is ubiquitous in its uses. Caution: Concentrated hydrochloric acid (fuming hydrochloric acid) forms acidic mists. Both the mist and the solution have a corrosive effect on human tissue, with the potential to damage respiratory organs, eyes, skin, and intestines irreversibly.